I got this material from a student last year, and I only got a little! It was unique in that all the layers are evenly spaced. 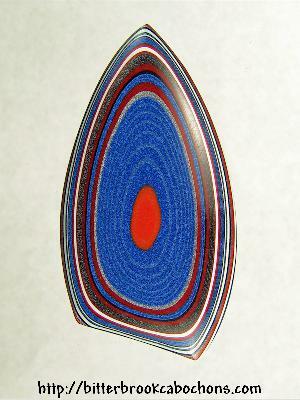 This resulted on very orderly patterns in this pretty freeform teardrop cabochon. Cut from the same slab as this one. 42mm x 22mm x 4mm. Weight: 14.20 carats.